With the beaver dam and pond reaching the level of road, we felt it was time to do something to maintain the pond at it's current level. Enter Mike Callahan of BeaverSolutions.com. Mike has installed more than 1100 flow control and culvert protection devices around the country. Mike arrived on the scene at 10:00 AM. After scouting out the best place to put the device, Mike began construction of the flow cage. The cage is submerged about 40 feet from the dam and the pipe will run from the cage to the top of the dam where it will be camouflaged in such a way to hide it in plain sight. The installation was watched by about a Sherwood residents, Marty Devine of the Raymond Conservation Commission, and Patrick Tate of NH Fish and Game. Special thanks to Patrick for pitching in and helping Mike and I with the installation. The event was filmed by Warren Barnes. His work is featured in time lapse video below and will be part of the Sherwood Glen Beavers documentary, I will be creating this summer. This was Warren's first shoot, but you would never know it from watching the footage. The way the device works is simple. Since water seeks it's own level, anytime the pond level rises to the height of the bottom of the pipe, water will flow over the dam. The sound should not attract the beavers and the cage will prevent them from feeling the flow into the pipe. The installation was completed without a single hitch. Mike said that one reasons was the fact that we were being pro-active. In most of his installations, he is called in only after there have been serious problems with flood, which complicates the situation. So, by about 12:30 the cage had been built, assembled and installed. The last thing Mike did was to make two small breaches on either side of the pipe. That served two purposes. First, it dropped the level of the pond to the point where no water was flowing out of the pipe, and second, it gave the beavers something to work on that night so they wouldn't notice the pipe. I came out to check the pipe at about 7:00 PM. The smaller of the two breaches had stopped flowing on its own with the pond level drop. The other was still going strong. When I checked again at 7:00 AM, I was greeted with a loud tail slap as the beavers had done their job and were finishing up for the day. 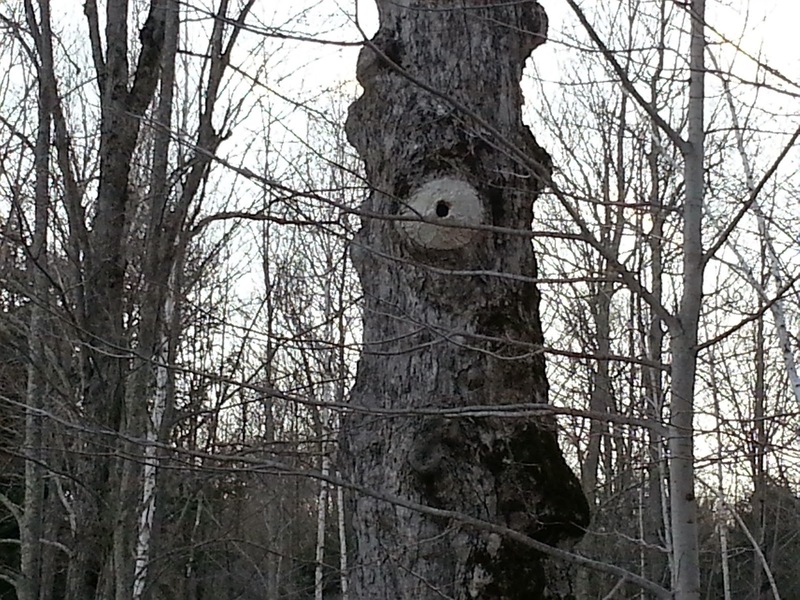 Beavers and the Bird's Nest Mystery. Yesterday, some of the members of the Conservation Committee took a walk around the trail. Rachel pointed out an unusual tree trunk, bird's nest. These pictures show the amazing structure. It's in a very large, old swamp maple at the west end of the pond. I've certainly seen nothing like it and that nearly perfect circle of discoloration seems to have a lot of other people stumped. I posted a pictures to the Facebook Beaver Management Forum and asked for ideas. There's a lot of curiosity, but no one has yet come up with a good answer. Probably the closest match anyone has found yet, is the red breasted nuthatch. It used pine resin around it's tree trunk nest. I don't think that it, because the gray-white ring doesn't look like resin and an Internet search for images, showed no symmetry involved in their sap spreading. If it's a nuthatch, it has OCD and an engineering degree. The tree appears to be one of the biggest and oldest around the pond. Unfortunately, the beavers have taken a liking to it and have begun gnawing. I have never seen them go after a tree this size. I suspect they may not be looking to down it, but rather simply dining on the bark on the exposed roots and base. In either case, it's not a tree we want to see go down. I was Sunday afternoon when I realized they were up to their dam chewing. I had some stakes and fencing still around from past repairs. It was a quick patch job and I'm not confident it will keep them away if they have a mind to chew. Here's 25 minutes of wire wrapping in a minute and a half. The fencing and posts can easily be breached if they manage to get under it on the side that is in the water. I'm hoping that it's enough of a bother to them that they just move on to something else. I'll know more tomorrow.